Madison Shelley, grad student and founder of the UNT SSA chapter, talks with Grad student Alec Huntley about street epistemology. Street epistemology is a method of exploring a person’s belief system. The recently founded UNT chapter of the Secular Student Alliance, which intends to fill a void for atheist students who feel underrepresented on campus, covers topics related to atheism including separation of church and state or street epistemology in their meeting and plan on increasing their visibility this semester. 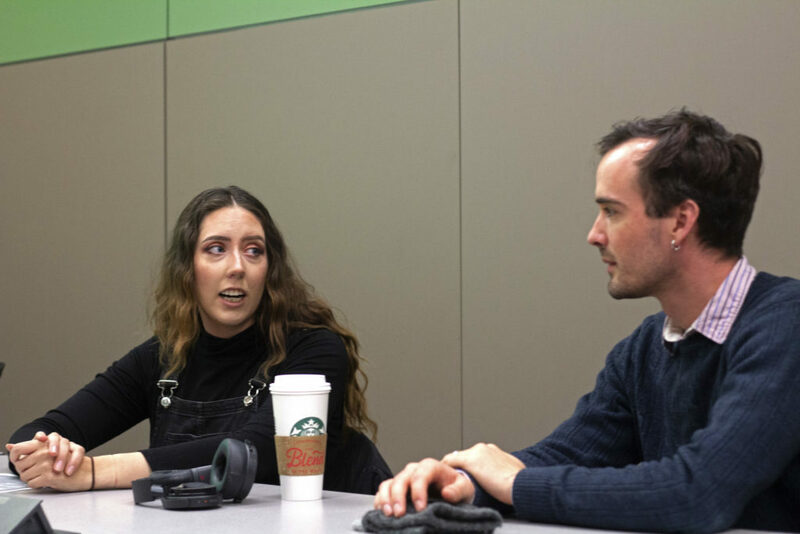 Madison Shelley, a masters student studying public administration, started the Secular Student Alliance last October after unsuccessfully seeking out an atheist group to join on campus. Most of the 10 members said they were seeking out a place at UNT for people with beliefs similar to their own. Behavior analysis student Nicolas Taliaferro, 20, coincidentally attempted to contact the Secular Student Alliance to join the UNT chapter just a few days after Shelley’s application was accepted. The Secular Student Alliance is a national nonprofit organization with approximately 304 chapters at both an high school and college level. The alliance “empowers secular students to proudly express their identity, build welcoming communities, promote secular values, and set a course for lifelong activism,” according to their website. As part of their efforts to increase involvement this semester, the group plans to incorporate street epistemology—the study or a theory of the nature and grounds of knowledge especially with reference to its limits and validity—around campus and set up a table alongside other organizations. With approximately 36 religious groups on campus, the Secular Student Alliance members said they felt UNT did not have a place for people with similar ideologies. Marketing junior Will Boss said he recalled not being able to join groups based on his beliefs. Last semester, the group discussed looking into volunteer events to give back to the community, throwing Secular Student Alliance based events and potentially establishing a lecture series as well as facilitating a structured debate at the university. Despite not being an official university organization yet, Shelley said the group plans to use their resources and connections to the national group to develop a sustaining atheist organization that lasts at the university after they have all graduated.